I started issuing a list of my favorite desserts in 2011 because I noticed something exciting happening in pastryland, and I wanted a record of it. At the time, many pastry chefs were branching out and exploring new territory, while others hunkered down to improve upon what was already there. And in just a few, short years, together, they have widened the borders of their domain, and have made it a considerably better place in which to treat ourselves today. Once relegated to the corner of the kitchen as an afterthought, desserts have moved up on the restaurant menu to be an integral part of the dining experience. 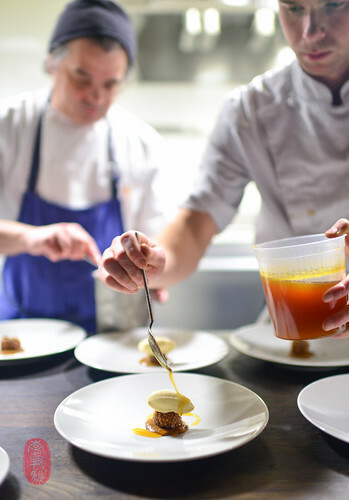 Pastry chefs too, once nameless and faceless, have moved into the spotlight, making a way for themselves apart from the restaurant line behind which they’ve traditionally been hidden. While I’ve celebrated this sweet progress for the past four years, I noticed its growth stunting in 2015. And I’d like to take a moment to talk it through. In my prior post about my favorite dishes of 2015, I had expressed my increasing boredom with cooking at the high end, pointing to a homogenization and commoditization of ideas as the probable cause. I’ve noticed something similar happening with pastries and desserts. While the overall quality of what is being produced has increased, much to the benefit of consumers like me, I feel like the frenetic pace at which ideas and creativity had been churning in the pastry kitchen has slowed considerably – at least in the limited circles in which I have been eating. But that’s not necessarily a bad thing. As I said, I think that industry standards have risen because of it, as pastry chefs, collectively, have begun to narrow their field, focusing on what’s important. They’re pushing for higher quality among themselves, which has created higher expectations among their audiences. You definitely won’t find me complaining about that. As a result, I think we’ve arrived at a high plateau in pastryland, affording all – pastry chefs and diners alike – a clearer survey of what’s out there, and more even and steady footing. Although I’ve seen far too many carrot and beet desserts (I get it, they’re both colorful, sweet, and not fruit, and therefore “unexpected”), I’ve also seen far fewer flights of fancy that sound more interesting than they are good. There was a stretch, early on, during that period of frenetic excitement to which I referred, when I felt like pastry chefs were raiding Dr. Seuss’s closet for the strange and whimsical and parading their find for spectacle (not unlike what the American political parties seem to be doing this election season). But their fascination with the remote has thankfully abated, and pastry chefs seem increasingly content to leave whatever experiments they’re conducting in the kitchen in favor of offering the tried and true at the table. And that too is a really good thing. So, as I sat down to review my year in eating, I began realizing that 2015 was more about trading in excitement for the satisfaction of finding good, quality cooking, which is something for which I constantly long, and for which I have advocated often here. 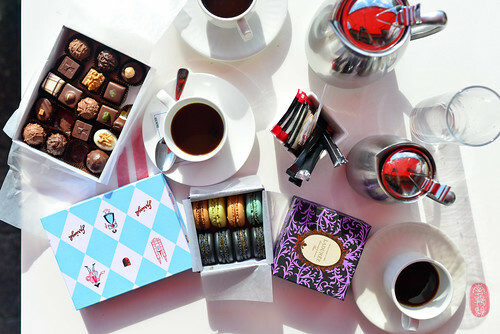 That being said, the lack of excitement did make it harder for me to find 25 desserts about which to write. So, free of quotas and editorial requirements that might dictate otherwise, I have decided to trim this year’s roster accordingly, choosing only to feature what truly excited me in 2015. Therefore, you will only find 15 desserts below. I ate a frightening amount of confections throughout my travels in 2015, not all of which were in restaurants, or as a part of a meal (that is to say, not the type of desserts that are the primary focus of this annual list). In fact, I’d venture to guess that the majority of my sugar intake happened in pastry shops, bakeries, and during afternoon coffee stops along the way. Since this year-end round-up is just as much about preserving, for my own memory, the best of what I have eaten as it is about sharing it with you, I want to take a moment to record for all of us some of the more memorable sweets I had in 2015 that aren’t listed among the 15 below. My appetite for ice cream is insatiable. And when I find it, I often want it all. Just across the city’s “lakes,” I found one of Jacob og Jakob Ice Cream carts parked at the base of Rosenborg Castle. The wide, open Kongens Have park, which stretches out from the castle’s moat, was the perfect place to enjoy a hand-dipped licorice ice cream cone on a sunny, summer day in Copenhagen. In gloomy Reykjavík, I found Turkish pepper ice cream at Ísbúðin Valdís along the city’s dock-side warehouses. Although widely popular in Scandinavia, that was a new flavor for me (it’s licorice spiked with ammonium chloride and peppercorn). 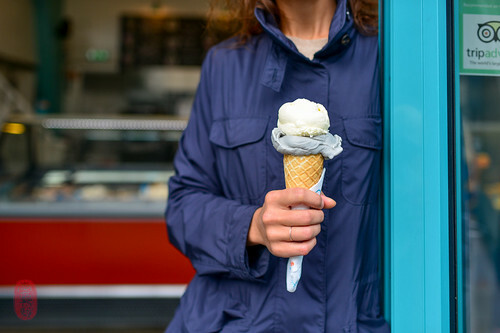 The ice cream’s ashen, grey color, belied its slightly soured, peppery heat. I loved it. And in Paris, I relished a return to Maison Berthillon on the Île St-Louis, where the flavors are always seasonal and strong (this time, I especially admired my scoop of boozy “Creole” – rum raisin – ice cream). If you like ice cream, you must go to Margie’s Candies on the corner of Armitage and Western in Chicago. While the interior looks like something from Archie Bunker’s dreams, the menu looks more like something from mine. 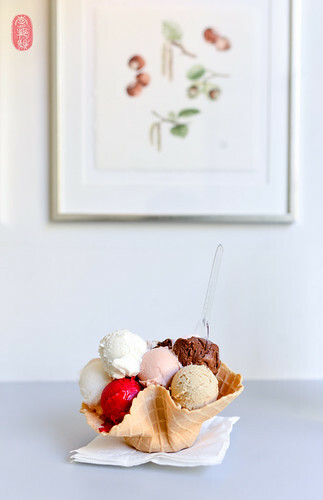 It’s entirely devoted to ice cream: sundaes, shakes, and banana splits (which, like this sweets shop, are far more charming than they are pretty). Speaking of banana splits, I had a beautiful one while taking an afternoon coffee on the sidewalk at the famous Confiserie Sprüngli in Zurich. I whiled away a sunny afternoon there, admiring the well-tailored Swiss strolling up and down the Bahnhofstraße. My love affair with pie continues (and it will never end). I stuffed my face with the icebox pies at Town Topic in Kansas City more often than I’d like to admit (and chef Justin Yu is correct: the pie shakes here – literally, a slice of pie blitzed into a milkshake – are not to be missed). And I’m pretty sure I had every pie that Megan Garrelts offered on her menu last year at Rye in Leawood, Kansas at least a dozen times each (her coconut and banana cream pies remain my favorite, but there also appeared a terrific rhubarb pie, fragrant with citrus). In August of 2015, I horrified my Danish friends with the amount of pie I ordered for the three of us at Duarte’s Tavern in Pescadero, California. But at least this time, I finally got to try the pecan pie that had sold out the first time I was there (I wrote about that visit last year). It was very good. Later, in November, I was lucky enough to have a friend swing through that forlorn town along Highway 1 to pick up two slices of Duarte’s pies and deliver them to me down the coast in Carmel: blueberry and ollalieberry, please and thank you Shawn Gawle. In Chicago, I swung by Bang Bang Pie Shop on my way up to Wisconsin for lunch at a friend’s place. I think we agreed the key lime and spicy “Mexican silk” pies were our favorites. The breakfast pastry is its own kind of wonderful, isn’t it? While the Norwegians love their svele – those dense pancakes that I had a couple of times in 2015, slathered with jam and sour cream – Icelanders love waffles. The one at Kaffi-Mokka in Reykjavík was so large that the checkered mattress arrived practically falling off the plate. The one at Tíu Dropar down the street was cut cross-wise, and was crispier, which I preferred. 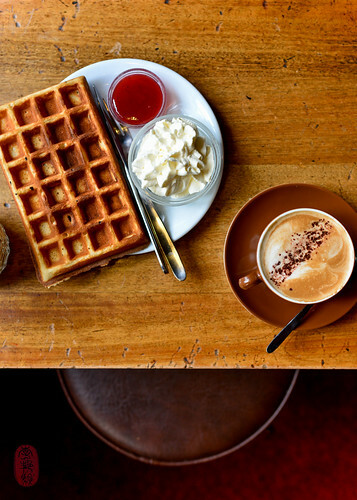 But both were served with whipped cream and jam, which, together with the waffle, offered an indulgent foil to the stiff, ultra-dark coffee they drink in that country. Neighbor Bakehouse in San Francisco’s Dogpatch district makes terrific viennoiserie, including a giant chocolate-filled claw and a beautiful pistachio and blackberry “croissant” powdery with confectioners sugar. I found terrific gibassier – that bready, sugar-dusted pastry kissed with anise and orange – at both Pâtisserie 46 in Minneapolis and Standard Baking Co. in Portland, Maine. I had an English muffin from The Model Bakery in St. Helena, California for breakfast almost every day I was in Napa for the Twelve Days of Christmas. Among the many luxuries that passed my way during that three-week run, I count these buttery buns among my most favored. They toast up so well, golden and gorgeous. And nearer to my home, I was thrilled to discover that the young brothers Petrehn, Taylor and Reagan, whose ages combined barely surpass my own, have opened up a bakery and coffee shop in their hometown of Lawrence, Kansas (perhaps better known to the rest of America as the home of the University of Kansas Jayhawks). They named it, simply, 1900 Barker, which is its address. Taylor sheets his own dough, and makes incredibly flakey croissants (some of the best I’ve had in the U.S.), quiches, and terrific breads (he mills up to 30% of his own flour, he told me). Kind, enthusiastic, articulate, and uncompromising in their push for quality, the Petrehns give me hope for the future of pastryland. With a few exceptions, this year’s list of my favorite desserts is comprised of relatively simple propositions. You’ll find little more than ice cream and some garnishes at the top and bottom of the list, and at a couple of points in between. Rice pudding appears twice. That’s surprising, considering I don’t even like rice pudding – proof that anything can be made great if made well. There are cookies, hand pies, and even a molten chocolate cake – proof that simple can be spectacular if crafted with care. Brooks Headley, the talented pastry chef of Del Posto for many years, has had a strong track record here: five of his desserts have appeared on this list in the past four years (at least one a year, including the number one dessert in 2013). So, it’s not surprising that two of his desserts found their way onto my list of favorites again this year. While I won’t preclude the possibility of his reappearance here in the future (and I very much hope that he does reappear here), I was very sad to see Headley leave the pastry department in 2015 to pursue his own venture, Superiority Burger. Hat tip to you, Mr. Headley. I wish you the best of luck (which I’m sure you won’t need). But, as that great pastry chef moves slightly off-center stage, another waits in the wings for a reprise. After four years away from the kitchen, John and Karen Shields are gearing up to open Smyth in Chicago. Together, they have consistently produced desserts that have made my year-end list of favorites (two in 2011; and one each in 2012 and 2013). They give me hope that I might find excitement again in 2016. Honey, olive oil, ground coffee. Risalamande – a bastardization of the French riz à l’amande – is a Danish, Christmastime dessert. As its name suggests, it’s rice pudding with chopped almonds folded in. One whole, blanched almond is also added, and, as tradition goes, whoever finds it gets a prize (sort of like finding baby Jesus in the king cake). I had the pleasure of being introduced to risalamande by my friend Mark Lundgaard Nielsen’s family. His father made this dessert to cap a special Christmas feast he cooked for me at their home, which included a giant pork roast wrapped with a thick rind of crackling. The pudding was rich and creamy, and the nuts in it, having swollen with milk, had gone tender, almost indistinguishable in texture from the rice. A side of meatycherries, with their ruby run of residual acidity helped slim things down just a bit. That was my favorite part. This dessert is exactly what one needs on a hot, steamy, night in Taipei. It was cold and refreshing, bringing the tropical fragrance of lime and longan together with the milky sweetness of coconut. Australian Kai Ward, who is co-chef at MUME with Long Xiong and Richie Lin, doubles as pastry chef here. And he’s doing a fine job of it. Whipped cream of salted caramel, granola. This dessert appeared on my list of favorite desserts in 2011. And it’s not surprising that it appears again this year. In the five years since I last had the rice pudding at Chez l’Ami Jean, I’m happy to report that it has not changed: a giant bowl of creamy porridge, large enough for four or eight, light as air, with salted caramel whipped cream and granola on the side. At Stéphane Jégo’s Chez l’Ami Jean, you shouldn’t end your meal any other way. 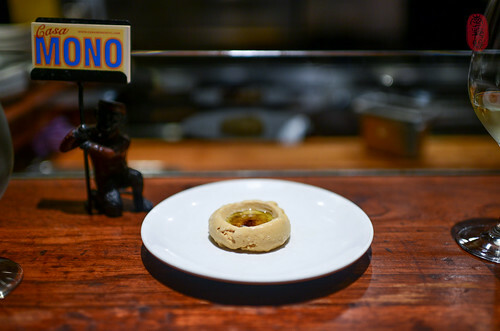 Peanut, respado of preserved cherries, mezcal. I’ll admit: when I wandered over to the pastry station to see what they were making for dessert that night, I was a little confused by what I found. Queso fresco cheesecake? With a peanut crust? And shaved ice? Say what? But, together, it was fantastic – a miracle, in fact – combining a number of things for which I have little fondness – cheesecake, peanuts, and mezcal (I know, I’m losing credibility quickly here) – and turning them into an exciting dessert. Particularly, I loved the tart, preserved cherry respado (shaved ice), subtly spiked with the boozy, leathery, smokiness of mezcal that approximated the flavors of Mexico without reducing them to a caricature. and served warm with heavy cream. So difficult to pronounce is rødgrød med flød (which literally translates as “red porridge with cream”) that the Danes use it, half-jokingly, as the yardstick by which proficiency in Danish is measured. Mark Lundgaard Nielsen first introduced me to this traditional Danish dessert on a hunting trip. 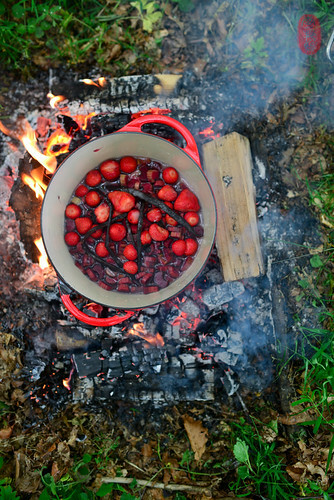 He instructed me how to prepare the ingredients and cook them over the campfire: I combined strawberries, rhubarb, sugar, and vanilla beans, split, in a dutch oven and brought it all to a simmer with some water. Stewed until the fruit was soft, the warm compote was served in a bowl with a spot of heavy cream. A few nights later, he served me a more refined version at his restaurant, Kong Hans Kælder, which I list here as one of the best desserts I had in 2015.
crème glacée butternuts & coulis beurre noisette. What many claim to be the father of the modern “molten chocolate cake,” Michel Bras’s “biscuit tiède coulant à la vanilla de Tahiti” (the provenance of which the chef proudly date-stamped on the menu: 1981), arrived at our table, slightly modified. In an “interpretation on the original,” this tall, cylindrical cake, which oozed a runny heart of warm chocolate, was crowned with a turn of butternut ice cream, and sauced with brown butter coulis. It was worthy of sitting atop a world-wide phenomenon that took dessert menus from here to Tibuktu by storm. 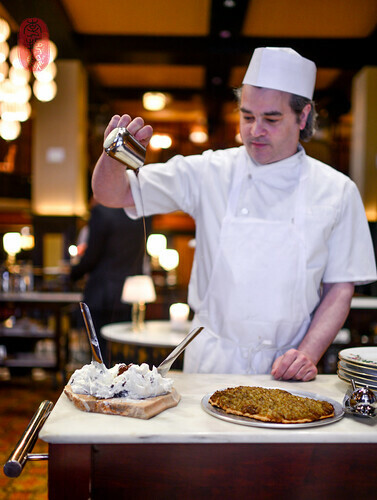 Brooks Headley’s apple fritelle appeared on this list in 2014. In 2015, at the third Friends of Lysverket dinner in Bergen, Norway, Headley, in the spirit of the dinner series, which encourages guest chefs to draw inspiration from local Norwegian ingredients, modified his fritelle, replacing the crunchy-crusted apple fritter with one made from banana. Having lost some of the natural acidity in the apple, he found it again in cloudberries, which he reduced to a syrup, bringing balance back to this terrific composition of textures and flavors. I had this dessert over a half dozen times in 2015, and every time, this ice cream, which was stuffed into a hollowed-out mandarin, was just as good as the last: a spoonable creamsicle, with the texture of marshmallow fluff. Alla Napoletana with sheep’s milk ricotta stracciatella. This dessert appeared among my favorites in 2011, and again in 2012. 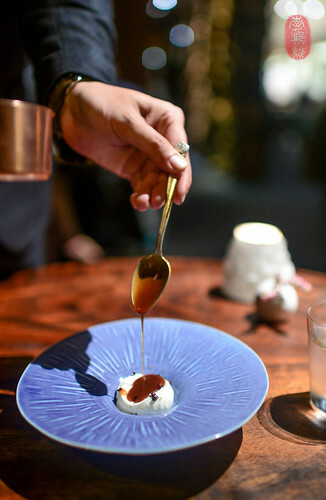 As if foretelling his impending departure from Del Posto, in January of 2015, Brooks Headley came out of the kitchen to present it one last time, a figurative table-side bow with the dessert – an unlikely meeting of eggplant, chocolate, and sheep’s milk – that has brought me so much pleasure in the past few years. Thank you, Mr. Headley. These soft, buttery cookies seemed a little misplaced at breakfast. So, mistakenly, I relegated them to the outside circle of plates as an afterthought to the more exciting spread of cured and potted meats, offal, cheeses, bread, jams, and juices before us. Of course, when I finally got around to them, they were a welcomed discovery at the end. Thankfully, I found the recipe in the Fäviken Cookbook when I got home. It’s listed as “Douglas’ Shortbread Biscuits” on page 208. I’m sure the butter and eggs used at Fäviken had a lot to do with why they were so yellow, so soft, so delicious. But the version I made at home from the recipe wasn’t bad. Simple, but incredibly well-made, that thumbprint cookie I had on a snowy, dark morning in the northern expanse of Sweden was one of the most memorable moments for me in 2015. Lovage can sometimes be a little overwhelming to me. And so can gjetost – the “brown,” Norwegian cheese that is essentially caramelized goat’s milk whey. So balance (which is one of Christopher Kostow’s many fortes) was key to making both of them shine brilliantly in this dessert that put the sweetness of a dried “black” apple at the center of it all. The apple (Sierra Beauty varietal) had been reduced to a shriveled, meaty knot, the result of a baking and dehydrating process that takes over 60 days, concentrating its flavor, giving it depth. Caramel cooked in the fire, smoked cocoa nibs. Milk ice cream, as bright and fresh-tasting as the morning dew, provided the perfect, pristine backdrop on which to stain a smokey stream of warm, buttery, salted caramel. Cocoa nibs, also smoked, provided a bitter, crackling crunch, bringing the sweetness of it all in check. A simple sundae made with top-shelf ingredients and top-shelf care, this was my favorite dessert of 2015. 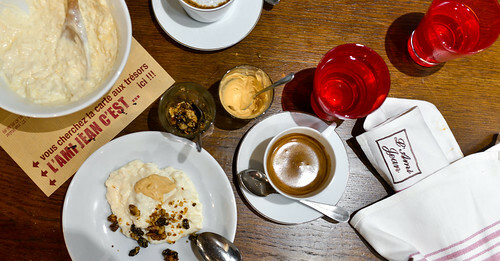 Photos: The Riz’o Lait at Chez l’Ami Jean in Paris, France; a waffle cup with twelve mini scoops of ice cream at Østerberg Ice Cream in Copenhagen, Denmark; coconut (top) and Turkish pepper (bottom) ice cream at Ísbúðin Valdís in Reykjavík, Iceland; chocolates from Confiserie Sprüngli and macarons from Ladurée in Zurich, Switzerland; the waffle at Kaffi-Mokka in Reykjavík, Iceland; Brooks Headley plating melanzane e cioccolato at Del Posto in New York, New York; the salted caramel ice cream at Casa Mono in New York, New York; Brooks Headley (in the background) plating his banana fritelle at the Friends of Lysverket at Lysverket in Bergen, Norway; rødgrød med flød on the campfire in Søbo, Denmark; the milk ice cream with smoked caramel and cocoa nibs at Saison in San Francisco, California. ~ by ulterior epicure on February 4, 2016. “simple can be spectacular if crafted with care”, this is the motto to anything in life!